Anti-discrimination charity Kick It Out has expressed "serious concerns" over social media posts made by new AFC Wimbledon manager Wally Downes. When announcing his appointment on Tuesday, the League One club stated they were aware of tweets, which are "not consistent with our values". In September, the 57-year-old ex-Dons player tweeted a reference to gay rights legislation in India, using the hashtag "#RainbowLacesTurbans". Downes has apologised for the posts. "My comments were meant to be humorous but on reflection they were a mistake," he told the Wimbledon website. "I apologise for my previous use of social media." Downes was in charge of Brentford between June 2002 and March 2004, and has since held coaching posts at Reading, Southampton, West Ham and QPR. 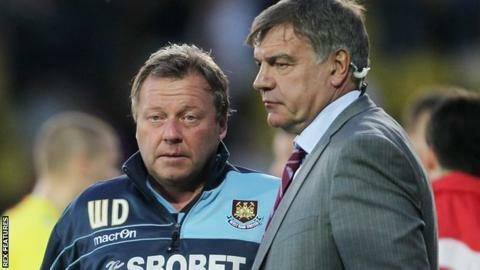 Since leaving QPR, where he worked alongside Harry Redknapp, he has been coaching at Indian Super League clubs Kerala Blasters, Jamshedpur and ATK and has returned from South Asia to take the Wimbledon job. In a statement, Kick It Out said: "We have been speaking to the club over the last few days and expressed our serious concerns over some of the tweets from Wally Downes." Wimbledon, who are 23rd in the third tier, said "we have agreed a series of actions with Wally that we believe will demonstrate his commitment to the club's values". The club added: "We have talked at length with Wally about this, who has accepted that these messages were ill-judged and he has assured us that they do not represent his views. "In the light of these discussions, we are satisfied that these do not represent Wally's views." Downes, who played for the old Wimbledon FC, replaces Neal Ardley following his departure on 12 November after more than six years in charge. He played more than 200 league games between 1977 and 1988 as the now-defunct club rose from the fourth to the first tier but, after a spell at Sheffield United, was forced to retire because of injury. Ex-Wales, Fulham and Stoke coach Glyn Hodges has been named assistant, with interim boss Simon Bassey returning to his role as first-team coach and Steven Reid leaving the club.